When Eleanor moves into the downstairs apartment in Owen’s duplex, Owen teaches her how to fence (sort of) and how to make secret codes, and Eleanor teaches him how to build a pulley system to send notes and brownies between their apartments. It looks like it will be a great summer… except that Eleanor doesn’t plan to stay. She wants her old house back, the house across town with the cool tree house—and she plans to run away and live in the tree house. Owen kind-of-accidentally promises to keep her secret and to help her escape—and then feels terrible, since he knows neither of them are allowed to ride the bus by themselves, much less run away from home. Owen and Eleanor Move In is a story about what it means to have a home . . . and what it means to be a friend. 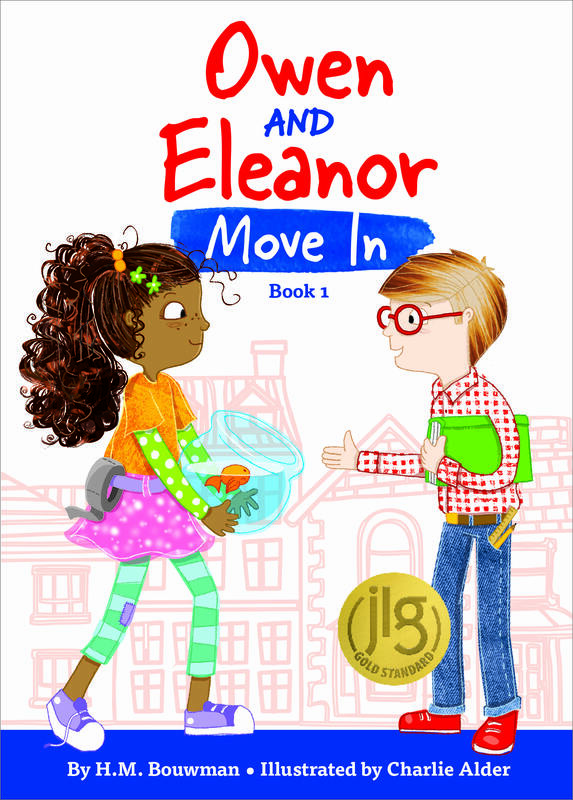 Owen and Eleanor Move In is ideal for early readers, about ages 5-9. The book is published by Sparkhouse Family–their first foray into chapter books! “A heart-warming story about friendship and faith, with plenty of great humor. Eleanor and Owen are sure to win over readers.” —Debbi Michiko Florence, author of the Jasmine Toguchi series. • Owen and Eleanor Move In is a Junior Library Guild selection! • Owen and Eleanor Move In is a finalist for the 2018 Cybils! Illustrations from The Land of Make Believe by Jaro Hess, from The David Rumsey Map Collection, courtesy of Rosen-Ducat Imaging. All other materials © 2019 H.M. Bouwman. All Rights Reserved. Website by Websy Daisy.